Africans plagued by the deadly Ebola virus are receiving in-depth information about the outbreak in a brochure produced by medical experts at Vanderbilt University and printed by United Methodists in Liberia. 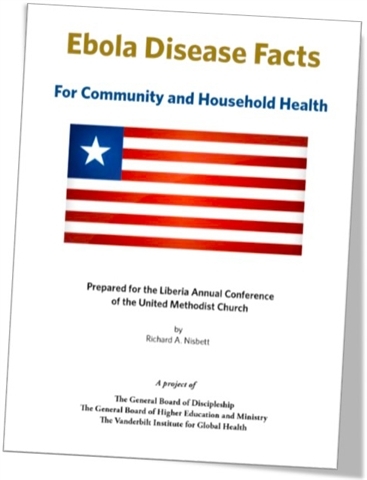 The brochure, which was prepared for the Liberia Annual Conference of The United Methodist Church, is the result of a partnership between the Vanderbilt Institute for Global Health, the General Board of Higher Education (GBHEM) and Discipleship Ministries. The brochure, Ebola Disease Facts for Community and Household Health, was prepared by Richard A. “Ran” Nisbett, Adjunct Professor for the Institute for Global Health at the Vanderbilt School of Medicine in Nashville. It currently is being distributed in Liberia and soon will be available in Sierra Leone. The piece has been translated from English to French for distribution in Côte d’Ivoire and Guinea. As of mid-December, 3,290 people have died from the 7,797 Ebola cases reported in Liberia during the current outbreak, according to the U.S. Centers for Disease Control and Prevention and the World Health Organization. In Guinea, 1,518 deaths and 2,394 cases were reported, and in Sierra Leone, 2,033 deaths in 8,273 cases. “What some of our contacts (in Africa) told us is that they hadn't really had much in-depth information about Ebola itself,” she said. Because of the urgency, the brochure was sent to Monrovia laid out and ready to be printed by a publishing team already established under the guidance of Discipleship Resources International (DRI), a ministry of Discipleship Ministries. DRI partners with episcopal areas in Central Conferences to create publishing teams and to develop their capacity to provide contextual resources for their areas. The publishing team is distributing the brochure to clergy and lay people who can get the message out to the people, as a contribution to the broader health plans under GBGM leadership. The brochure also explains that the Ebola outbreak also is occurring in other African nations. “We think that kind of gives a perspective, even a theological perspective to the people there in Liberia because I think it would be easy for them to think, ‘We've had 20 years of civil war, and now this scourge has come down on us. Why does God reign this down on us? Why are we the ones that get punished?’ when in fact, this is in other places,” Pippin said. Although the brochure’s distribution is beginning within the United Methodist connectional system, some of the material is being made available to the Catholic school system for use in high school libraries throughout Monrovia. To download the brochure, go to http://bit.ly/1z3dkCc. The Vanderbilt Institute for Global Health wanted to see how well health messages could be distributed to people in Africa through the church, which is a trusted organization in African cultural life – even more so than doctors and hospitals, Pippin said. The institute had heard about the DRI’s e-reader project, which provides Kindles with theological resources to African seminary students, and asked about also putting health documents on the e-readers, Pippin said. “They learned about our connections with the publishing team in Liberia, so we made the decision to go beyond the e-reader to actual print to get it to more people,” she said. Those discussions led to the printing project partnership. To avoid delays, Discipleship Ministries hopes to raise the initial $40,000 cost of brochures for the four countries by the end of the year. Early funding partners include Canterbury UMC and the Thompson Family Foundation, both in Alabama, and the Independent Presbyterian Church (IPC) Foundation. “We're seeking donations from anyone who is interested in helping the church instruct about Ebola – from individuals, congregations who might want do a special offering for it and organizations that have an interest in health initiatives,” Pippin said. For information about how to contribute to the Ebola brochure project, contact M. Scott Gilpin, Executive Director for Fund Development at Discipleship Ministries at sgilpin@gbod.org.